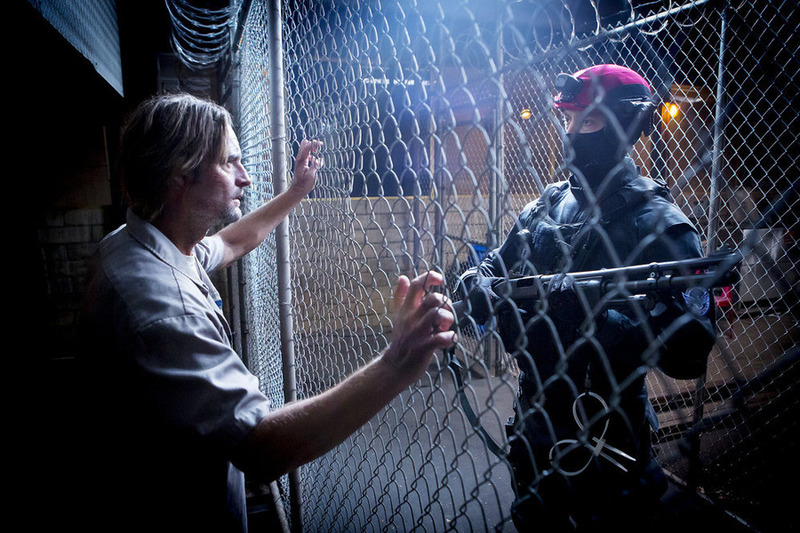 Josh Holloway returns to series television this fall in what might just be an alien invasion series for USA Network, Colony. I say ‘might be’ because it’s never explicitly stated that the occupiers of Los Angeles are aliens. In an occupied Los Angeles, Holloway plays a husband and father who must collaborate with the occupiers to keep his family safe – despite wanting to resist them. Colony’s first trailer is now available and it looks like a tense ride. Check it out after the jump. CBS Sets New Date For Intelligence Premiere! CBS’ spy/techno-thriller Intelligence, starring Josh Holloway and Marg Helgenberger, will premiere following a new episode of NCIS on Tuesday, January 7 before moving into its regular timeslot the following Monday, January 13th. Holloway stars as Gabriel, an intelligence operative with a super-computer microchip in his brain that connects him to the global information grid. Helgenberger plays Lillian Strand, head of the cyber-security agency for which Gabriel works. Michele Ory is Riley Neal, Gabriel’s handler/babysitter who must try to protect him from outside threats as well as his own recklessness. For more, check out the press release after the jump. TELEVISION: Lost: You’re Gonna Love Jughead! Well, sir… Lost [ABC, Wednesdays, 9/8C] is continuing on its roll! Among other things, we learn that Locke [Terry O’Quinn] was born in March of 1956 – and that ties into Charles Widmore [Alan Dale] in a supremely unexpected manner. It also figures in explaining why Locke was visited by Richard Alpert [Nestor Carbonell] as a child. The more you learn about this show – the more answers you get – the more questions arise. Take Faraday’s mother… please! If you can find her… And just wait until you meet a certain member of Desmond’s family! And speaking of Faraday [Jeremy Davies], he gets to make a definitive statement – though not about the physics of the island [though he also gets to do some actual science stuff, too]. Latin. The dead language plays a role here, too. A small but pivotal part. After screening three episodes of Lost, Season Five, I have to say that the pieces of the Cuse/Lindelof mosaic really are falling into place. As the season moves inexorably, but nimbly, towards its conclusion, you can kinda see the outlines within the Big Picture falling into place. Because You Left, The Lie and now, Jughead are all extremely well put together episodes. The scripts have been tight, well-paced and feature that odd mix of character and mythology that differentiates Lost from everything else on television. The direction has been, if anything, even crisper than in the past – these eps haven’t played like the three hours they’ve taken up in our schedules. Finally, the cast of Lost continues to make us believe in these characters – all of whom are lost in one way or another and seeking to find themselves. It’s really only because of the well-developed characters that we can believe in the mythology of the show. If we didn’t care about Locke, we wouldn’t have been so worried when he faced the Smoke Monster in Season One. If we didn’t care about Faraday and Charlotte [and isn’t amazing how quickly we’ve taken to them? ], we wouldn’t be worried about that nosebleed. As long as the characters remain relatable, and the pace of the revelations [answers should soon begin to outnumber questions, judging by this week’s ep], then the show will continue to hold sway over those of us who still watch [whether in real time, or online, or whatever]. Judging by what I’ve seen so far, there’s a lot of fun/drama/weirdness to come. 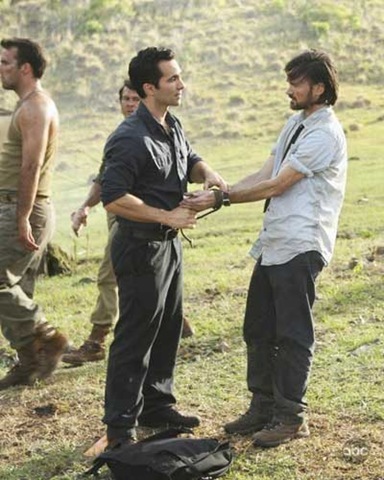 I’ve just seen the two-hour premiere of season five of Lost [ABC Wednesdays, 8/7C, beginning on Jan. 21st]. You think it was strange and wild and exhilarating before? Just wait until you see what’s next! Although my agreement with ABC is that I can’t give away plot points, I can, perhaps, give clues. I can tell you that Vincent’s back – and that Sawyer plays a more prominent role. I can tell you that things have changed between Benjamin Linus [Michael Emerson] and Sayid [Naveen Andrews]; that Hurley [Jorge Garcia] has reached his limit on lying – and that Sayid’s life may depend on him; I can tell you that a potential legal problem may change Kate’s [Evangeline Lilly] and Aaron’s lives, and that Charlotte [Rebecca Mader] may not be well. And speaking of Hurley, remember Dave? And Charlie’s enigmatic appearance at the mental institution [“I’m dead. And I’m here”]? I can safely say that Hurley sees dead people. There are lots more clues that I could give you in that vein, but when the events to which they allude happen, all that’ll happen is that some answers will be given [like why Hurley finally reaches his limit with The Lie] and more will be asked [like what’s happening to the people who were left on the island]. Even the titles of the two parts of this season’s premiere have titles [Because You Left & The Lie] that are carefully gauged to give hints that spawn unexpected answers and set the stage for more [and possibly bigger] questions. As is always the case with Lost, context is everything. Carlton Cuse and Damon Lindelof co-wrote Because You Left and Stephen Williams’s direction keeps up a pace that matches that of last season’s three-hour finale. Revelations are given in quick bursts and emotional moments in almost a state suspension – but no scene lasts for more a few moments. The Lie, written by Edward Kitsis and Adam Horowitz and directed by Jack Bender, keeps up that pace, for the most part but lingers a bit more over the key emotional sequences, giving them more heft as the give and take of answers and questions mounts. I have to say that I enjoyed the season five premiere episodes as much as the three-part season four finale. Everyone we care about gets a choice moment or two and the plot forges onward. The rollercoaster ride that is Lost is definitely maintaining the quality level it regained last season.